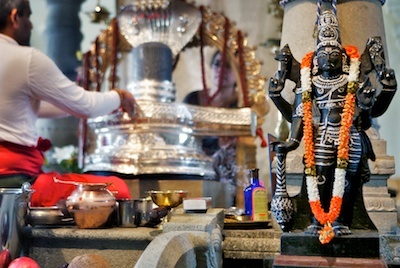 Sri Somesvara Temple is a Vedic Shiva Temple that strictly adheres to Vedic guidelines in order to maintain the purity and power of the Temple. We list these guidelines so that you may help maintain the purity of Sri Somesvara Temple. Conservative, light-colored clothing is appropriate. Women are asked to wear loose clothing that covers their legs, shows no cleavage, and has sleeves. Wearing shorts (for anyone over 12 years of age) is not advised. Please remove shoes before entering. Leather items, in any form, are not allowed in the Temple. Women, during their cycle (menstruation), are open channels to energy and therefore become more susceptible to the energies of the environment. Negative energies can enter and positive energies are easily dissipated through them at this time. This time naturally affords women the opportunity to go inward and rest deeply. It is a window to advance spiritually if one’s relationship with it is healthy and wise. For the duration of a woman’s cycle (menstrual period) she should not go to the Temple, Temple ceremonies, near the Pandit, and even near sacred objects within the home. Her cycle should be complete before she resumes any of these activities. Those who will be visiting the Temple should not touch or hug a woman who is resting after washing and dressing for their visit. If children will be visiting the Temple, the father could help them dress if need be. While a woman is on her cycle, she should let others cook and handle any foods or objects taken to the Pandit or the Temple. While a woman is on her cycle, it is best if she remains inward. The use of Mantras should be discontinued during the first 4 days of a woman’s cycle since the physiology is especially sensitive during this time. Please do not enter the inner sanctum or other shrines. Only the Pandit is allowed to enter these. Please do not touch the deities or the shrines with hands or feet. Please do not lean into the shrines. Do not point the bottom of your feet toward any of the deities. This is considered inauspicious and impolite. Men and women are asked to avoid showing affection and usually sit separately. No videos or photographing inside the Temple. Please turn off all cell phones and electronic devices before entering the Temple. Put left middle and thumb on the two horns of Nandi and the right hand petting the tail. Then look through the horns to the Shiva Lingam. Then only, it will become complete Darshan. Next, put palms together for Namaskaram for Shiva, then each deity, going clockwise. On the first round, stop in front of each deity. On the second and third rounds, walk slowly around while doing Namaskaram. 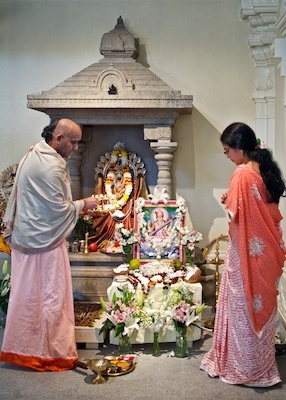 Pradakshina is not to be done while a Puja is being performed. 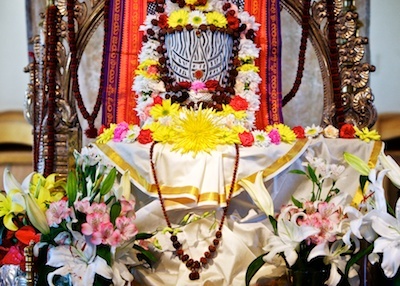 Pradakshina can be performed 3, 9, 11, 21, 41, or 108 times. Please maintain silence during Pujas and other ceremonies. Children are most welcome, though please take them out if they become loud or distracting. Chairs are provided for those unable to sit on the floor. Chairs should be kept by the wall with care so that no person’s back is to a deity. To apply Kumkuma (sacred red powder), gently touch your right ring finger to the powder and then to your forehead in the center just above the eyebrows. To apply Vibhuti (sacred grey powder), gently touch your right middle finger, ring finger, and thumb to the powder. With the right middle finger and ring finger, apply Vibhuti across the forehead starting on the left side. Then with the thumb, apply Vibhuti across the forehead just below the other two lines, starting on the right side. Please do not offer anything that has fallen onto the floor. Please make offerings with your right hand, using the ring finger, middle finger and thumb. To accept Theertham (holy milk or water), put right thumb between the index and middle finger, and fold index finger down. This will make a bowl that you accept the Theertham in. Put lips to the base of the palm to drink the Theertham. 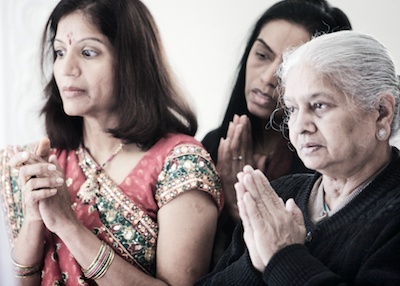 Please receive Prasadam (blessed food or fruit) with your right hand. Please wait to enjoy the Prasadam until you are outside the Temple or, if it is cold, rainy, or windy, sit inside the Temple and eat your Prasadam. Please keep the Temple floor clean while eating. When you are done eating Prasadam, throw any trash in the trash can outside the front door. Please do not use indoor Temple trash cans for personal trash. Please refrain from gossip or worldly talk. Except for Prasadam, food and drink are not allowed in the Temple. Alcohol and smoking are not allowed anywhere in the Temple complex and surrounding areas. If your child is eating or carrying a food item, please make sure you stay outside the Temple until the child is finished. Please help us maintain the cleanliness and purity of the Temple. If you bring flowers or fruits, please take any plastic wrappings or trash with you when you leave. We invite you to participate in the preparation for ceremonies. Please inquire if you would like to be involved in this way. Donations to the Temple can be placed in the Hundi box. Dakshina/donation to the Pandit can be placed on the plate. Thank you for your cooperation. If you have any questions or comments on these guidelines, please feel free to ask one of the volunteers at Sri Somesvara.